Plot: A young woman finds out she is royalty from another planet and must figure out who to trust before she gets killed and the earth gets destroyed. It's finally here! Channing Tatum with dog ears and eyeliner can now live in your home! The best, worst movie of the decade is now available on DVD. This film shot to cult-classic status in its first weekend in theaters, and is now ready for your own play-at-home version of Mystery Science Theater 3000. 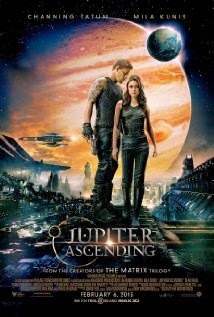 JUPITER ASCENDING is a visual masterpiece, the action scenes are incredible, and the world building is fascinating. The downside though is that the story is pretty thin, there are several holes in the back story that make it difficult to understand why certain things are the way they are, and the acting is mediocre. (Granted it's got to be nearly impossible to act out a scene when you are running around on green boxes in a green room and pretending that you are in mortal danger). This is a really fun popcorn flick. It's not going to rock your world, but it will afford you a great night. Even if that night is nothing more that 2 hours of mocking what you see on the screen. Plot: A con-man brings on a female apprentice, but it's all a game of who is conning who. 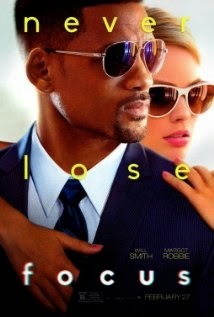 If you are looking for a fun, edge-of-your-seat, high-stakes con movie, FOCUS will completely satisfy. This film is exciting, smooth, intense and has enough twists and turns that, even though the information is right in front of you, you won't figure out the con until the very end. For the most part everything in this movie is done well and rings true. There are a couple of things that are put in for convenience, but those can be easily forgiven since the rest of the film holds up so well. This is a nice change of pace for Will Smith and a much better introduction to Margot Robbie than we got in THE WOLF OF WALL STREET. Their chemistry is great, which is nice because we will be seeing them together again in the near future in SUICIDE SQUAD. The show stealer, though, is Adrian Martinez. He is pee-your-pants funny and just a great all-around character. I was surprised that this film was rated R. It deserves that rating, but just barely. I think they could have made a much better and wider-reaching film had they edited down to a PG-13 rating. The best thing about this film is that you can just sit back and enjoy the con. It doesn't take a lot of brain power, nor does it keep important details from you. Everything is there, you just have to focus. Fans of the Spongebob TV series will really enjoy this movie. Like the TV show it is funny, goofy, slapstick and heartwarming. For those of you worried about the transformation of drawn Spongebob to computer generated Spongebob, never fear. The CG version is well done and only about one third of the movie is in CG. The story is simplistic, but still interesting and the references to pop culture are really funny. Plus there is an awesome rap battle that is worth the price of admission by itself. 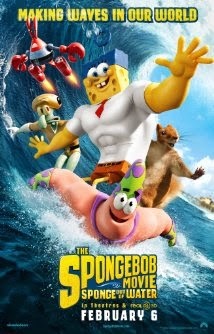 Even if you've not seen any episodes of Spongebob before, this movie will make you laugh and feel good. This is another formulaic inspirational sports film offered up by Disney, but it's also a really good movie. 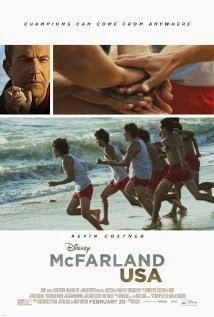 If you liked MILLION DOLLAR ARM you will love McFARLAND, USA. Kevin Costner seems to have really hit his stride with the last few films he's been in, and the rest of the cast does an outstanding job as well. The movie does run a bit long, but it's worth it in the end. If you are looking for a good flick for the whole family this week, give McFARLAND, USA a shot. It might inspire you and your family.